Over the past 2 months, 2 of our Club’s Youth Sailors have been putting in the extra hours to train and race on the newly acquired Topper dinghies – all in preparation for this year’s 2018 Meisha Campus Topper World Championships, held in Longcheer Yacht Club, Shenzhen. 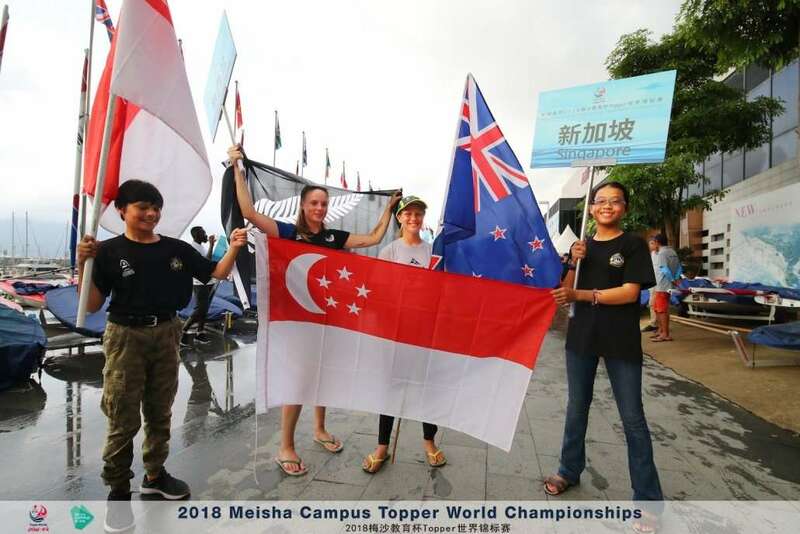 This was the first time in many years that Changi Sailing Club has sent a team to represent Singapore and the Club at an International Regatta, let alone World Championship. Both Angel Chew and Luc Patel travelled out of the country to compete for the very first time, in the 5.3 and 4.2 class respectively. With 222 participants in the 5.3 fleet and 45 participants in the 4.2 fleet, it was the largest Topper Worlds Event ever! The 267 sailors represents a total of 20 different nations from 5 continents. The oldest competitor is 71 years old, hailing from Japan! The youngest competitor is 9 years old, from China! This is the first time the event is held outside of Europe. John Parrish, PRO for this Championship left at 2am in the morning to officiate at the Asian Games held in Jakarta. Alas, despite the excellent turn-out, the winds / weather did not deliver. A recent typhoon wrecked havoc in nearby hong kong, sucking up much of the wind pressure, leaving our racing area with erratic bouts of rain and glassy waters. After a frustrating 5 days of racing with only 2 races completed in the 5.3 class and 5 races completed in the 4.2 class, the fleet was left without a World Champion, as a minimum of 4 races was needed to secure the qualifying series and establish the Finals showdown. Despite the unsatisfactory outcome, sailors made the most of the week in Longcheer, making new friends and exploring the nearby beach + town. Angel and Luc had much to be proud of, the former having nearly secured a top 20 finish in 1 of her races, only to have the race committee eventually abandon the race. The latter was the surprise package of the 2, as Luc completed all 5 races to place a credible 37th out of 45 boats in the 4.2 class. This was a big improvement from his performance at the recent Singapore Nationals in June, where he struggled to finish in most of his races. More importantly, I strongly believe competitions of this magnitude accelerates positive growth and builds character – both sailors show immense potential in sailing and increased levels of maturity, proving themselves to be dependable, self-reliant and thoughtful athletes over the course of the Regatta. We would like to take this opportunity to thank Vanke Meisha Campus for the strong support as sponsors, Longcheer Yacht Club & Hotel for the warm hospitality and officials from ITCA for the race management and logistical feats. Not forgetting the wonderful support from Angel’s and Luc’s parents – providing us with delicious dumplings, noodles and fruits over the period of the regatta – thank you so much!